Urgyen Sangnag Chöling, courtesy of Spiti Tulku. 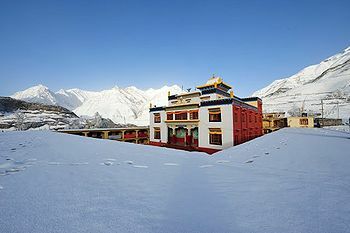 Urgyen Sangnag Chöling is a nyingma monastery located in the Spiti Region of North India, upholding both the Pema Lingpa and the Dudjom Tersar lineage. All of Urgyen Sangnag Choling’s activities are overseen by Spiti Tulku. The monastery provides a place for many monks to live, practice, and study Dharma. Urgyen Sangnag Chöling also has a school where the monks at Urgyen Sangnag Choling receive a secular education. It is open to any village children who wish to attend. In addition to the main temple, there are two other temples at Urgyen Sangnag Choling which are several hundreds of years old. One temple is dedicated especially to Guru Rinpoche and the other is dedicated specifically to the Pema Lingpa tradition and practices. The actual construction on the newest monastery began in the summer of 1993. The monastery was consecrated by the Dalai Lama in June, 2004. Spiti Rinpoche is now building a retreat center that will have eight retreat houses each for both the Dudjom Lineage and Pema Lingpa tradition practitioners and a small Lhakhang to be used for tsok practices and group practice on the special calendar days. In 2010, Dzongsar Khyentse Rinpoche gave the complete Dudjom Tersar empowerments in Urgyen Sangnag Chöling at the request of Spiti Tulku. This page was last edited on 1 June 2014, at 07:06.